It’s a limited-run, special edition MTN Dew can inspired by beloved character Arya Stark and her training with the Faceless Men of Braavos. When warm, the cans appear brandless. Once chilled, they reveal Arya’s iconic kill list, a tribute to those killed and a glance at her remaining targets for the final season. MTN Dew enlisted NBA All Star Joel Embiid, a core member of the DEW roster and notable Game of Thrones fan, to tease the sacrifice #ForTheThrone across social channels. 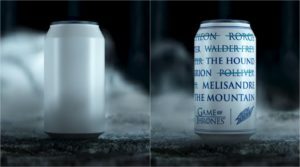 In addition to the cans, PepsiCo is taking its Game of Thrones collaboration one step further by reimagining the main title theme from the show’s opening credits. Dew rallied together a star-studded cast complete with Migos, The Chainsmokers and more to mash-up the theme by singing the lyrics in true Dew spirit: Dew-Dew…Dew-Dew-Dew-Dew… The Game of Thrones-inspired track also debuts a new verse from Migos.